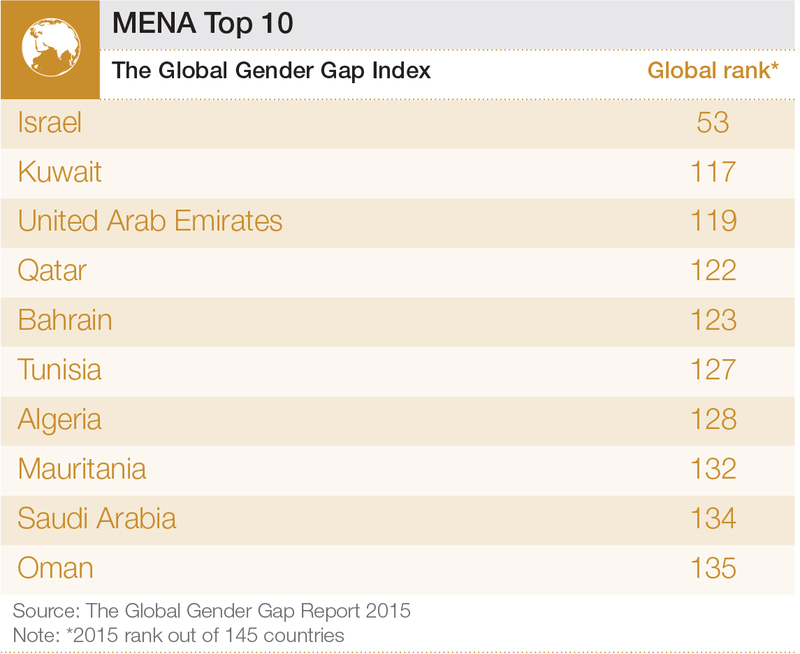 Israel continues to lead the regional rankings for Middle East and North Africa in the Forum’s latest Gender Gap Report. Bahrain, meanwhile, is the best climber in the world on the economic participation and opportunity scale. The report ranks 145 countries on their ability to tackle the gender gap and ensure women are not held back in four key areas: health and survival, education, politics and economic equality. 1. Israel (53rd out of 145 countries) continues to hold the top spot in the Middle East and North Africa region and moves up 12 places on the overall ranking due to improvements across the board. It is the second-worst performer when it comes to paying women the same wage as men for doing similar work. The country is the region’s second-most improved country on the health and survival sub index since 2006. 2. Kuwait (117) drops four places this year. It is the region’s second-best performing country in the educational attainment indicator and the third-best performer in economic participation and opportunity. 3. The United Arab Emirates (119) ranks first in the region on literacy rate and third on wage equality for similar work. Since 2006 it has improved across all sub indexes except for health and survival. 4. Qatar (122) is the region’s second-best performing on economic participation and opportunity, but the lowest scoring country for political empowerment, where it has closed only 1.3% of the gender gap. 5. Bahrain (123) scores above the regional average on economic participation and opportunity, with the region’s highest score on the wage equality for similar work indicator. It is the world’s most improved country in the economic participation and opportunity sub index, and the second-most improved of the region on the overall index since 2006. Nevertheless, it is also the least improved country since 2006 in both the educational attainment and political empowerment sub indexes. 6. Tunisia (127) ranks best in the region for healthy life expectancy and second best on the percentage of female legislators, senior officials and managers. 7. Algeria (128) scores highly in the region for political empowerment, due to the fact that 32% of its parliamentarians are women. 8. Mauritania (132) is the third-best performing country for political empowerment, with 27% of women in ministerial positions. It is the most improved country of the region in this sub index since 2006. Still, it is the second-lowest performing country in educational attainment, with the lowest enrollment of women in tertiary education. 9. Saudi Arabia (134) drops four places from last year. Since 2006, the country has shown the region’s largest improvement on the overall index and the second-largest improvement in economic participation and opportunity. In educational attainment, it is the fifth-most improved country in the world. However, it is the world’s fifth-least improved country in the health and survival sub index. 10. Oman (135) drops seven places from last year. It is one of the lowest-scoring countries for political empowerment for women. Author: Saadia Zahidi is a Senior Director, Head of Gender Parity and Human Capital and Constituents at the World Economic Forum. She is a Founder and Co-Author of Global Gender Gap reports, Corporate Gender Gap Report and Human Capital Report.